(L-R) Tal Badt, Director of Business Development, Tsinghua x-lab, Patrick Chung, Founding Partner, Xfund, Lord Norman Foster, President, Norman Foster Foundation, Sophia Yen, CEO & Co-Founder Pandia Health, Douglas Hansen-Luke, Executive Chairman and Founder of Future Planet Capital and Lilly Bussman, Principal, Oxford Sciences Innovation. Future Planet Capital is the world's first global innovation investment platform. Through a unique series of relationships and partnerships with top-tier university funds in Asia, Europe and the US, the firm possesses an unrivalled level of access to technology and life science companies from academic institutions and the "clusters of innovation" that surround them. 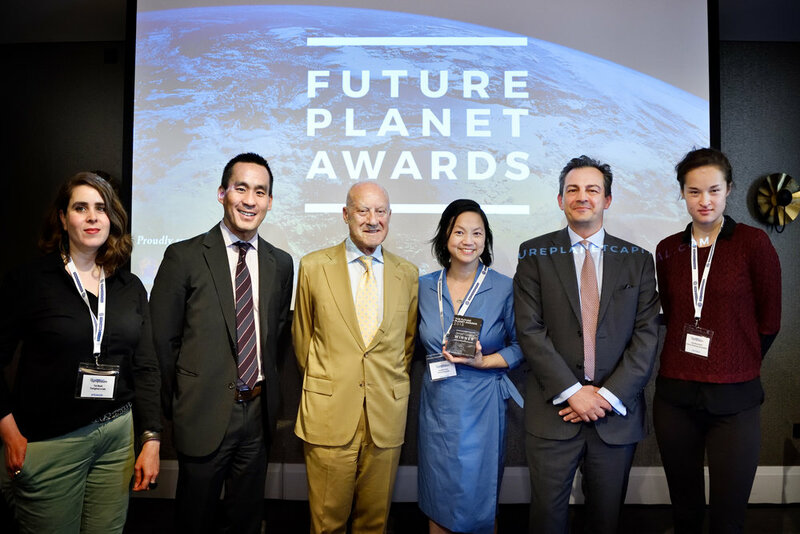 The Future Planet Awards raises the profile of new and growing firms that will profitably impact global challenges. In partnership with Global University Venturing, The Future Planet Awards provide a platform for growth companies to engage with leaders and influencers. Sophia Yen, MD, MPH, is the Founder and CEO of Pandia Health, the world's only female founded birth control delivery service, which offers care, convenience and confidentiality. Pandia Health offers the easiest way to receive birth control with free delivery, online prescriptions and automatic refills. As the winner of the UC Entrepreneur Pitch Competition at this year’s Global Corporate Venturing and Innovation Summit, her initiatives to make the process of receiving birth control as simple as possible have also been recognised at this years Future Planet Awards as the winner of the special category award. Here is an exclusive interview with Dr. Sophia about how she is changing the way birth control is received and understood. Thanks for having me! To start, I have 20 years of experience in medicine. I serve as a clinical Associate Professor of Pediatrics in the Division of Adolescent Medicine at Stanford Medical School and graduated from MIT, UCSF Medical School, and UC Berkeley with a MPH in Maternal Child Health. I am the Co-Founder and CEO of Pandia Health and enjoy educating the public and other physicians about birth control, acne, weight management, and other adolescent health issues. I believe that birth control and women's reproductive health is so important, especially in the formative years. I hope to be a pioneer in this industry and start a genuine conversation to become a resource for women and young girls all around the world. I’ve had incredible opportunities, such as hosting a TedX Talk, to create awareness - I truly think this is something special. What do you think is lacking in birth control education and how is Pandia Health changing the conversation? We are trying to de-stigmatize birth control. Birth control pills and rings and IUD with hormone, implant, and shot can be used for more than just birth control. We can use birth control to treat painful periods, heavy periods, periods that cause anemia, periods that make women who have anemia worse, to prevent endometrial and ovarian cancer. There are about 5 different progesterones and 3 different levels of estrogens that can be in the birth control pill. so if you don’t like the pill you are on, there are LOTS of others to try. Did you know that the top cause of missed school/work in women under the age of 25 is their periods? We have launched #PeriodsOptional. We have a blog, a YouTube channel, and a dedicated website which we will be launching soon. A research study with 1000 women showing that FEW of their doctors have discussed #PeriodsOptional. We are approaching this from parents of adolescents to adolescent women to perimenopausal women. I had the honor of speaking at my MIT 25th reunion during the TIM talks about #PeriodsOptional and we had women who were interested for themselves as well as fathers who had questions for their daughters and wives. We’re going to make women’s lives better by decreasing the number of periods, decreasing landfill via fewer tampons/pads, increasing school and work attendance. Pandia Health is educating women through media, blogs, Quora, in person talks at schools, workplaces, sororities, online, youtube videos, interviews on blogs. We are also collaborating on an academic paper to change the name from OCP to EPP. Oral Contraceptive Pill to Estrogen Progesterone Pills) to take away the stigma of it being for birth control. To take away this political football that they have made of women’s health. We already have POP - progestin only pills, so EPPs would be more clear and less stigmatized. Women’s health is more than just birth control, it’s about being educated on every step of taking care of your body. Curious about the Morning After Pill, EC, Emergency Contraception, Plan B? Here’s What You Need To Know. Are there any misconceptions about birth control and women’s health you would like to address? Yes. This incessant menstruation is a modern construct. If we compare ourselves to women in Mali, Africa per Dr. Beverly Straussman’s research, we have 350-400 periods in our lives, they only have 100. They start their periods at 16, have 3 periods a year, 8 children, breastfeed for 15-18 months. We start at 12, have 13 periods/year, have 1-2 children, breastfeed for 3-6 months. It’s hard to get it into people’s minds that if you are NOT on medicines, then you should have a period every day (otherwise, we need to figure out why you aren’t such as thyroid, malnutrition, stress, etc) However, we have medications that can turn off periods safely. Where do you see Pandia Health going and why do you think this new way of service is going to work? We are building the Brand that Women Trust with Their Health. We are the ONLY women-founded, woman led, practicing reproductive health doctor-, 20+ yrs of reproductive health advocacy- founded/led company in this space. It took a woman to realize that we have #BetterThingsToDo than run to the pharmacy each month and that if women can’t get to their ob/gyn’s office for a prescription, then they should still have easy access to birth control. It’s going to work because we have made it work and because women want/need this service. Ask any woman on the pill, patch, ring if she is tired of going to the pharmacy and would like it delivered. I’m willing to bet she will say YES! Congratulations again and thank you, Dr. Sophia, and your team at Pandia Health, for your achievements and exemplifying our mission to proliferate change! For more information, watch Pandia Health’s YouTube Channel and visit pandiahealth.com to learn how to start accessing free birth control today. Be sure to subscribe to our newsletter to stay up to date on all things happening at Future Planet Capital.